Hard to come by vintage fountain pen ink signature of cult favorite TV star Guy Williams who achieved fame as the male lead in both the series Lost In Space and Zorro. Even though this is a display on Lost In Space and there is a small "Z" at the bottom of the signature. 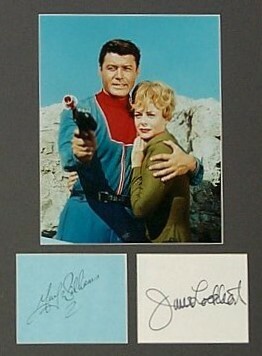 The display is matted/framed, and autograph with that of his co-star June Lockhart and a original studio color photo of the two as the "Robinsons." These signatures are guaranteed to be original and authentic and comes with Lifetime Authenticity. Value: $600.